We don’t want the fun to end!! 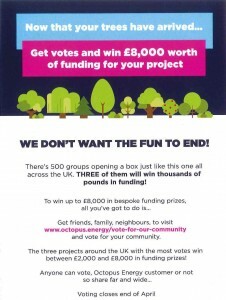 we are all really enjoying our new trees and what’s more, thanks to Octopus Energy we could be in with a chance of receiving free funding prizes of between £2,000.00 and £8,000.00. All you have to do is vote for us, ask your friends, family and neighbours, anyone can vote, Octopus Energy customer or not, so please do share far and wide. Voting closes end of April.